The main stage will feature headlining musical act, The Beaches, with special guest, Poesy, from 7 PM - 11 PM. The annual Last Lecture will take place in LR Wilson Hall (Concert Hall) from 4:30 PM - 6 PM, hosted Dr. Samantha Nutt, an award-winning humanitarian and bestselling author. The Last Lecture is free, but registration is required. There will be multiple rides, including a ferris wheel and Gravitron, various midway games, and complimentary traditional carnival food, such as cotton candy, churros, and caramel corn. Those interested in witnessing an interactive culinary cook-off with free food samples can attend the Hungry Games: Food for Thought with Liana Bontempo, a registered dietitian within Hospitality Services, from 6 PM - 7:30 PM in Celebration Hall. This event is free, but requires registration. In addition, students and attendees can take part in headphone disco, an open mic in Convocation Hall, and ESports in MUSC, featuring Mario Kart 8 Deluxe and a Super Smash Bros. tournament. Everything at Light Up the Night is is free and all McMaster students and alumni are welcome to attend. However, a McMaster University student card will be required to gain access to the free food vendors and rides. 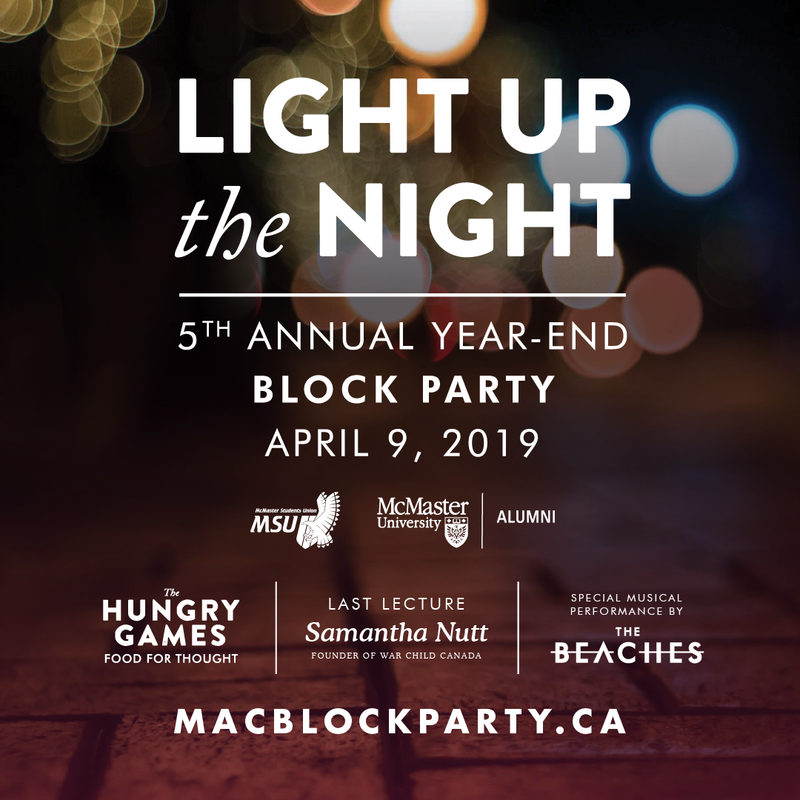 Additional details regarding Light Up the Night can be found on macblockparty.ca.